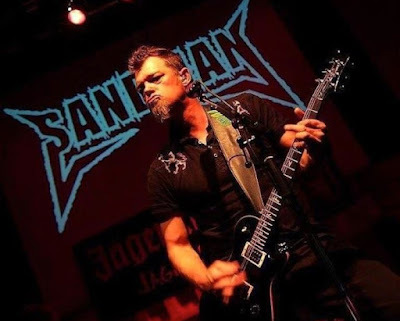 Last weekend, Sandman received a package from Metallica’a lawyers before a show at a London, Ontario club with a 41-page document threatening legal action over the use of the group’s name and trademarked, official, stylized logos. Billed as “Canada’s tribute to Metallica,” Sandman promote themselves with a stylized logo that appears similar to branding used by the veteran metal outfit. Once the news made international headlines, it caught the band’s attention and they stepped in to correct the situation. “We hear that a Canadian Metallica tribute band is a little upset with us and with a little digging figured out why,” posted the band on their website. “It turns out that a certain letter was delivered to the band Sandman that neither we nor our management were aware of until it surfaced online. Lucky for us, the band was kind enough to post it for us to see, and it turns out that we have a very overzealous attorney who sent this letter without our knowledge. “We have a long history of not only enjoying tribute bands, but we started as one. Heck, we even recorded a two-disc album of covers! We will always remember those days and continue to enjoy tribute bands, even inviting them to support us on various tours over the years. Sandman guitarist/vocalist Di Taranto confirmed the call from Lars Ulrich on Wednesday to apologize for the incident. “He gave me and the band his full blessing to continue on as we were," Di Taranto tells Rolling Stone. "They want us to continue paying tribute to Metallica with their full blessing and approval. We will continue to fly the Metallica flag, loud and proud!!"